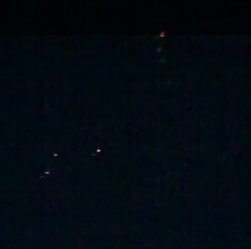 Fresno has been a major ufo hotpost over the years this recent sighting in May 2011 shows what looks like a triangle Ufo near a large plane. Its a plane with FAA lights. Very obvious by the pattern. Wow, this never should've been posted. Weak website with tons of misspellings. It's a perfectly ordinary plane. The second 'object' looks like a reflection in the car window to me. Looks like a B2 to me.